When Yu “Alex” Liang started graduate school at The University of Texas at Austin, he was tasked with running a straight-forward experiment to collect data on a well-understood phenomenon in fluid mechanics: how density differences influence fluid flow in a porous medium. It’s a scenario that plays out across a wide range of scientific problems. In fact, Liang was planning on applying the experimental data toward a larger project on carbon sequestration. However, the experiment revealed that the physics governing the flow was not as settled as scientists thought. The findings revealed that the primary driver of this type of fluid flow—called solutal convection– had been overlooked. What’s more, once this driver is accounted for, it completely flips the expected flow outcomes. The results of Liang’s research were published in the journal Geophysical Researcher Letters in September. His co-authors include Marc Hesse, a professor at the UT Jackson School of Geosciences and the Institute for Computational Engineering and Sciences (ICES), David DiCarlo, a professor at the UT Hildebrand Department of Petroleum and Geosystems Engineering, and Baole Wen, a postdoctoral fellow at the Jackson School and ICES. DiCarlo and Hesse are Liang’s Ph.D. advisors. For decades it has been the scientific consensus that the balance between density-driven currents and diffusion was the primary factor controlling solutal convection in porous media. The thinking went: regions of dense fluid move downward until diffusion eliminates the density difference driving the flow, creating dense fingers that sink toward the bottom. In general, the fingers have to be far enough apart so that diffusion cannot smear them out as the fluid sinks. Therefore, the fingers were generally thought to be further apart in slow flows and closer together in fast flows driven by bigger density differences. 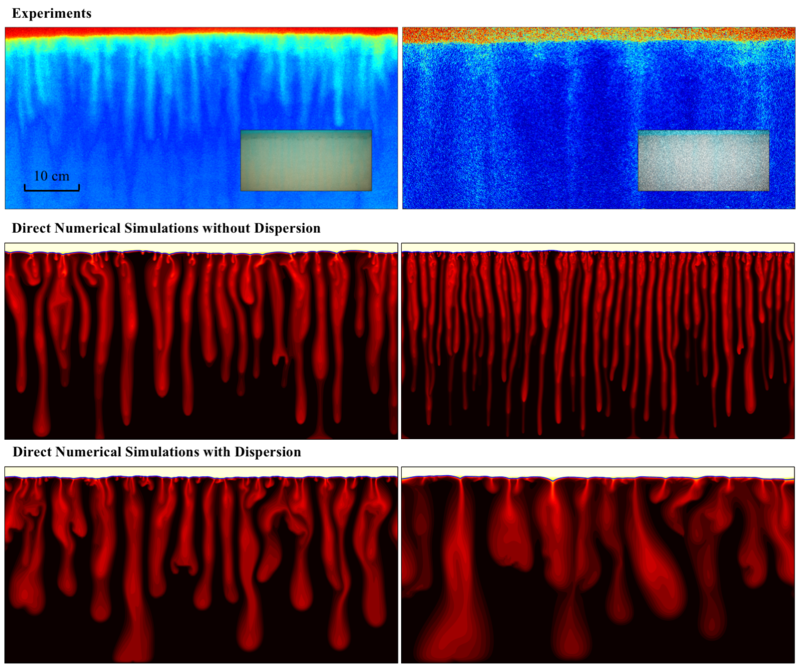 Images of solutal convection in porous media: The convection in the right column is much stronger than that in the left. The experiments (top) show that the convective pattern is coarsened at larger grain size (right), while the classical studies (middle) generally predict the opposite. After considering the effect of mechanical dispersion, the new simulations results (bottom) match well with the experimental observations. Liang et al. Despite the pattern being well-established in computer simulations, Hesse said that the research team was unable to find experimental results that demonstrate this basic behavior. So they developed a simple table-top rig—a transparent tank filled with glass beads and water— for observing solutal convection in real time. To start the convection process, the water was topped with a layer of methanol and ethylene-glycol—a mixture that is overall less dense than water, but gradually becomes denser and sinks as it undergoes convection with the water at the fluid interface. The team was expecting the classic narrow finger pattern to emerge in experiments that used larger diameter beads. Instead, the complete opposite pattern emerged. The finger spacing increased with bead size. A deeper analysis revealed that the dispersion created by the larger diameter beads had a greater impact on the convective environment than diffusion. While previous theories of solutal convection emphasize diffusion, the spreading of the material in the water in their experiments turned out to be controlled by mechanical dispersion, which leads to the additional mixing of the fluids at the pore scale. Based on their observations of the table-top experiment, the researchers were able to replicate their findings with a computational model. “The key point is that we analyze the effect of dispersion on convection in subsurface based on our experimental data and then use high-resolution numerical simulations to verify our analysis,” said Wen. Of course, the natural world is much more complex than a tank filled with beads or a simplified model. The researchers said that scientists have many factors to keep in mind when researching complex phenomena that involve solutal convection, such as CO2 sequestration. But DiCarlo said that these findings show that scientists studying the fundamentals of the process have some new factors to consider. Hesse added that the experimental results can help add a dose of reality to computational models that have been getting it wrong for decades. “If your numerical simulation can’t even simulate this simple experiment that I’m doing, what confidence do you have that it will do the right thing in an even more complicated setting,” he said. The research was funded by the National Science Foundation, the U.S. Department of Energy, the Hildebrand Department of Petroleum and Geosystems Engineering, and the Institute for Computational Engineering and Sciences Postdoctoral Fellowship.